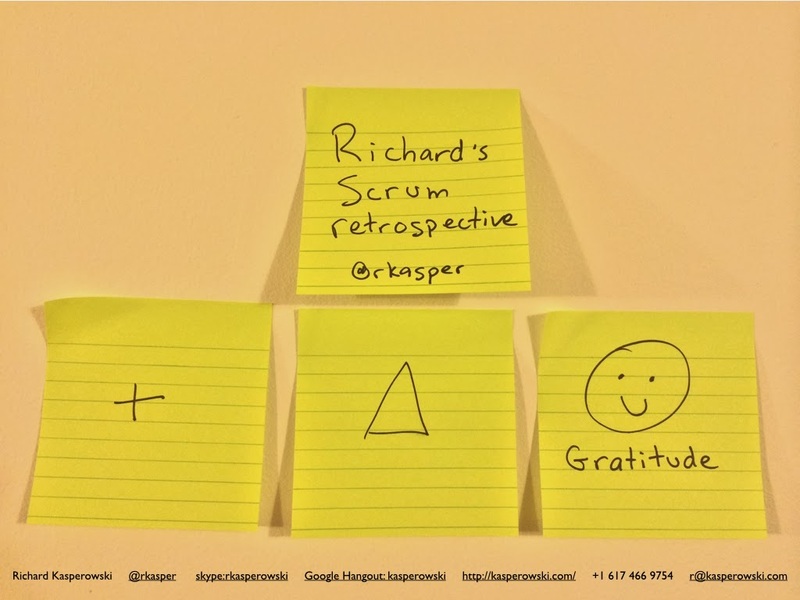 This is a transcript of the pecha kucha I shared at Give Thanks for Scrum 2013 in November. My slides are here. I’m Richard Kasperowski. I’m an independent Agile coach and Open Space facilitator. I wasn’t sure what to say today, so I followed the advice on page 11 of the Scrum Guide and held a retrospective. I used the PlusDeltaGratitude style of retrospective, skipping the Plus and Delta parts, and I discovered that I want to thank a bunch of people for all the kindness they’ve shown me. So this is like Thanksgivingdinner. We’re all going around the table giving thanks, and now it’s my turn. Thank you, Spencer Marks, for practicing XP with me, leading me to write the best code I’ve ever written, pushing me to want the best, travel to Belgium to share our experiences at a conference. (I love traveling, discovering new places, connecting with new people. Scrum and Agile help me do that.) Experiences with Spencer ultimately led to my taking a CSM class. Thank you, Jeff Sutherland, for my CSM class, for your academic papers and public talks, for a great conversation, and for an autograph in my copy of The Power of Scrum. Thank you, Ken Schwaber, for your books, your irreverent spirit, your encouraging attitude, and a great conversation about cycling–go HUCA! Thank you, Epiphany Vera and Glenn Dale. You are two of my former bosses. Thank you, Piph, for paying for the CSM class, letting me introduce and practice Scrum at our company (Nellymoser), and setting me on a journey of self-awareness and self improvement. Thank you, Glenn, for bringing me into Nokia because I was good at Scrum, for sending me to Finland to live and work, for sending me to India to coach teams there–all because I know Scrum. Thank you, Harrison Owen. I presented at the Scrum Gathering—more fun travel! 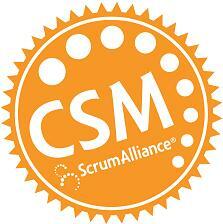 (Thanks again, Ken, for creating the Scrum Alliance, host of the Scrum Gathering. Thanks again, Scrum, for helping me travel.) At the Gathering, I experienced Open Space, facilitated by Harrison. I got to see the best in the world do Open Space, thanks to Scrum. Harrison inspired me to become an Open Space facilitator (and do more traveling!). Thank you, Brian Bozzuto. I practiced Open Space, facilitating a 6 week long Open Space with my teams at Nokia. Brian invited me to be the Open Space facilitator at the Agile Games conference. It was an awesome experience! It gave me confidence with larger Open Spaces, leading to more travel and fun later on. Thank you, Michael Sahota and Ellen Grove. You are two great people I met at Agile Games because I was an Open Space facilitator, because I went to the Scrum Gathering, because of Scrum. Michael helped set up Open Space at Agile Games and has become an important friend. Ellen connected me with Agile India and invited me to present there–more travel! Thank you, Lee Devin, Elinor Slomba, and Paul Margrave. At the Agile Games conference, I was inspired by Lee and Artful Making. I met Elinor, who became a great friend and taught me about anthropology (which I’ve incorporated into my coaching), and to be an artist; we used Scrum to organize a huge art project, with >1000 people drawing a 100,000 square-foot art piece together. Elinor introduced be to Theatre of the Oppressed, which led me to Paul. Theater of the Oppressed is about exploring power, and so is Scrum. Thank you, Dan Mezick, for teaching Scrum fundamentals before every Agile Boston meeting. Thank you for inviting me to participate as a volunteer and organizer and for inviting me to be a friend. Thank you for spreading Scrum and Open Space. Thank you for inviting me to be a presenter. (Dan is one of my special siblings, a brother; I’ll explain more in a minute.) Thank you for introducing me to Floyd. Thank you, Floyd Marinescu, for inviting me to be the Open Space facilitator at QCon in New York and San Francisco, and maybe London, China, and Brazil in the future (more fun travel and connecting with people! ), the grand finale of a recent 6 week tour. I’m an Open Space facilitator because I saw Harrison do it at Scrum Gathering. Thank you, John Buck and Mathias Vestergaard, culture hackers and corporate rebels, who I discovered through Dan and Agile Boston, and through the Culture Conference, which I got involved with because I was practicing Scrum. You are inspirers! You gave me ideas that I use when I share Scrum with the teams I work with. Thank you, Jim and Michele McCarthy, who I met through Dan and Agile Boston. Less than two years ago, you shared Core Protocols with me, you awakened me as a full human. You helped me discover feelings and courage. You connected me deeply with Dan Mezick the next three people I’m going to thank. And you gave me more travel: I plan to work with Jim in India. Thank you, Pat Arcady. You are one of my siblings, my sister, my friend. Thank you for sharing Non Violent Communication, OFNR—tools that I use when I share Scrum with teams I work with. I know you because of Scrum. Thank you, Frank Saucier and Andre Dhondt. You are two more siblings, brothers, and friends. Thank you for sharing coaching tips and life tips. I know you because of Scrum. Thank you, Wyatt Sutherland and Michael de la Maza. Thank you for freedom and independence. Thank you for helping me find clients as an independent coach. Thank you for more travel! My six-week cross-country tour was awesome! I know you because of Scrum. Thank you, Dan LeFebrve and Georgina Praiger. Dan LeFebrve is another sibling, a brother from Core Protocols. I know you because of Scrum. Thanks for inviting me to do this today. Georgina as chief organizer and get-it-done person for today’s event–let’s all thank her! Thank you! I know I didn’t say thank you to everyone I should have. Like Heang Ly, who helped me become a better facilitator. And many more. Thank you, Ken and Jeff, for inventing and spreading Scrum, for giving me amazing skills that I’ve used all over the world, connecting with people, and helping people be great together. Finally, I thank all of you. You’re all great people. Soon it will be your turn at the Thanksgiving table. Who did you decide to thank? Will you thank that person today?